3 Fifteenth Street -- located one building back from the beach. Tybee Island's newest condo complex, completed in 2005, is the perfect place for your vacation. Sun by the pool, stroll on the beach, or enjoy the breezes from your private porch. Park your car in your reserved space and walk to the beach, fishing pier, restaurants, and shops nearby. 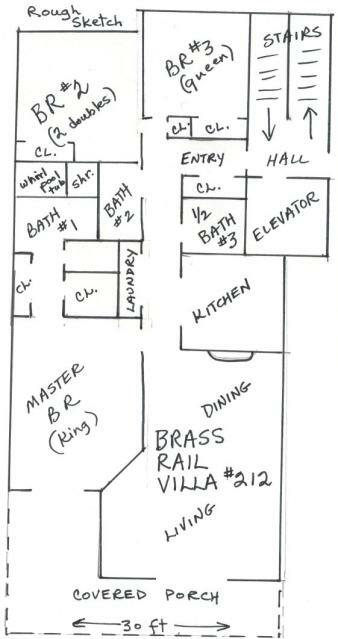 Comfortable furnishings, colorful décor, and convenient location await you at Brass Rail Villa #212. Sleeps 10: 1 king bed, 1 queen bed, 2 double beds, 1 hide-a-bed. And please - no pets, no smoking indoors! Living room has hide-a-bed sofa, futon sofa, TV, cabinet with games & books. Large dining table with leaf seats 6 or 8; breakfast bar seats 3. Large master bedroom has sitting area, walk-in closet, large bath with whirlpool tub and walk-in shower, 2 sinks. Enjoy swimming, golf, deep sea fishing, kayaking, cycling, and other sports. Visit Tybee shops & historic sites or tour the charming southern city of Savannah with its interesting buildings, restaurants, shops, riverfront, parks, and squares. Whether you want an active vacation or a peaceful retreat from daily life, you can find it at Brass Rail Villa #212. Seasonal Rates: September 15 through March 14; March 15 through September 14. 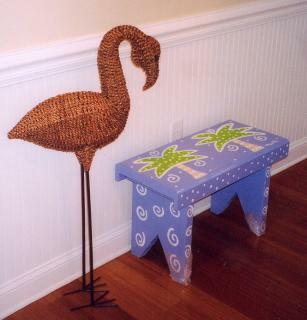 For more information and available dates, contact the rental agent listed above, Tybee Island Rentals. Click to see the pictures BIGGER or even BIGGER.